For those who experience back pain, mattress shopping can be an even more stressful experience than it is for most people. The problem isn’t a lack of options, but too many to choose from. That’s why we put together this guide to help you get the perfect mattress for your back pain. Lower back pain can prevent restful sleep and make your day miserable. The best solution to lower back pain is a mattress that provides the right support. It’s important to realize that support is not the same thing as firmness or comfort, although they are related. Support refers to how well a mattress keeps your neck and spine in proper alignment. Getting a mattress with the right support can make a world of difference for those with back pain. Firmness refers to the feeling of the mattress when you first get on it. Firmer mattresses usually create a floating effect for the sleeper, and softer mattresses allow for more sinking. On a scale from 1-10, with 1 being the least firm and 10 being the most firm, most people with back pain will benefit from something on the firmer side, in the range of 5-7. This gives enough support to help alleviate your pain, while allowing you enough sinkage to be comfortable. However, it’s important to note that everyone is different. For example, those weighing less than 150 lbs may want to avoid a firmer mattress as the floating sensation these mattresses cause can exacerbate back pain instead of helping it. The best way to prevent the sorts of pressure points that can result in back pain is to make sure that your mattress has the right kind of support in the right kinds of places. Pressure points cause you to shift in your sleep to avoid the uncomfortable feeling, and this shifting can take your back out of alignment. Finding a mattress with the right type of support is the best way to help combat these complications. Back pain can come from many different sources, and one of the best ways to help alleviate back pain is by getting a good night’s sleep on a mattress that allows your spine to stay in the appropriate alignment. Stress and anxiety are one of the most common causes of back pain, and stress and anxiety are made worse by a lack of sleep. Moreover, stress can make it harder to sleep, resulting in a painful cycle. Strained muscles can also cause back pain. Getting a mattress with the appropriate support is one of the best ways to minimize the effects of muscle strains on your body, as this allows your muscles to rest and heal. Pressure points from a lack of support cause you to twist and turn, using your muscles when they should be resting and healing. Another reason that some people experience back pain has to do with an abnormal spinal curvature. Maintaining a proper posture can help reduce the effects of an abnormal spinal curve. However, it can be hard to maintain good posture while you sleep. Getting a mattress with the right kind of support can help get your alignment straight, reducing the amount of back pain you experience each day. While we aren’t a medical website and we aren’t doctors, there are plenty of studies that tie getting good, restful, and supportive sleep to an improvement in back pain. However, because we’re not doctors you shouldn’t treat our claims as medical advice. If you have questions about back pain you should contact a licensed health professional for more information about your specific condition. With a 6 on the firmness scale, the Leesa is an appealing choice for those dealing with back pain. The Avena foam and other poly foams the Leesa uses are responsive, providing great support where you need it. The result is reduced pressure points and one of the best mattresses for back pain. The Loom & Leaf is a good option for those looking for a mattress for back pain but that still want a softer mattress. The Loom & Leaf comes in at a 5.5 on the firmness scale, and its quilted top layer and dense memory foam produce great deep compression support and contour. Nest has two different items on our list of best mattresses for back pain, the Alexander Hybrid uses a combination of zoned coils and memory foam to give good contour along with support. The zoned system targets support where you need it. The Alexander Signature Select shares many qualities with the Loom & Leaf, including the all foam construction and quilted cover. It allows for more sinkage, but this is balanced, so you’ll still get the support you need. There are a few different Amerisleep options for those with back pain, and all of them can be a great choice. The covers of an Amerisleep mattress have celliant, which can help improve the oxygenation of your body, which some have indicated can lower your back pain. 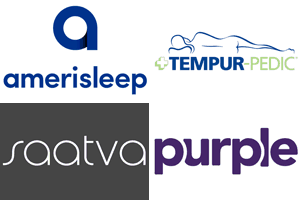 Much like the Leesa, the Purple mattress is becoming a more popular choice for sleepers with back pain issues. The top layer is made from a hyper-elastic polymer, which makes it one of the most responsive mattresses on the market. However, lighter sleepers may get a bit of a floating sensation on top of this mattress. Be wary of anything that seems too good to be true. Most mattresses priced at a very low cost are made from poor-quality materials and will wear out faster. This is especially important for those who experience back pain as even a small amount of increased sag can result in a greater amount of pain and a lack of sleep. It’s also important to note that most mattress warranties don’t cover this kind of slight sinkage, so you may be forced to buy a new mattress earlier than you otherwise would have, costing more in the long run both financially, and in terms of your health.